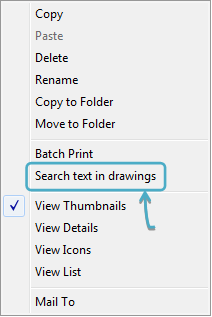 How to search texts in multiple drawings? Hold “Ctrl” and press “B” to go to the Browser mode. Type the test, choose a destination folder and click “OK”. Double click on a drawing thumbnail to view the drawing. 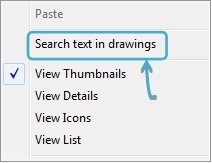 Use arrow button on the toolbar to switch drawings. Note: You may want to search again in the drawing to locate the specific text in a drawing, please see >> Search and find text in the drawing. I searched a keyword and it gives me 2 results. Double clicked one file and open the drawing. Now use the arrow buttons “Next drawing” and “Previous drawings” to browse all the matched drawings for reviews. 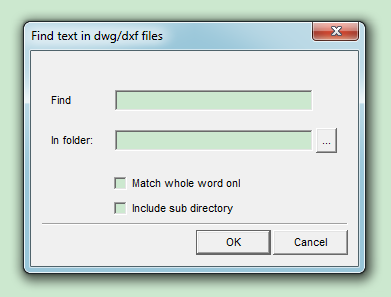 To precisely locate a keyword, hold “Ctrl” and press “F” to find the text location in the drawing.